Solid containers have solid sides all the way around and a solid bottom, making them suitable for fine powders and liquids. Vented containers have small slots on all sides and on the bottom, more fitting for produce, medium to large parts and contents needing air flow or drainage capability. The pallet skids on the bottom of the container. Some containers have the runners on the long dimension of the container so that the container is wider than it is deep when handled by a forklift. Short side runners run on the short dimension of the container so that the container is deeper than it is wide when on a forklift. This difference can be significant when it comes to aligning with machinery to dump contents into vats or other equipment, or fill from a particular piece of equipment. BulkBins are among the most versatile bulk materials handling containers available. In agricultural applications, go from field to wash and dry, grading, packaging, warehouse or distribution center storage and produce counter at the supermarket. Store raw materials, small parts, assembled components, automotive components for industrial processes as the product moves down the production line, then package and ship out to retail locations. 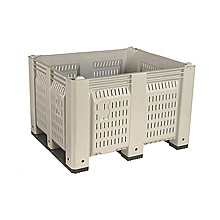 These high-impact resistant bins have fixed walls and are recyclable. Strong enough for loading with a forklift, durable in rugged conditions, and offer drain, lid, RFID tag and cardholder options. Available in both vented and solid containers, BulkBins come in 3 sizes: standard (48"W x 40"D x 31"H), square (48"W x 48"D x 28"H) and half-height (48"W x 40"D x 18"H).